First, you might want to see how to purchase an eBook from our store. Click to see how. 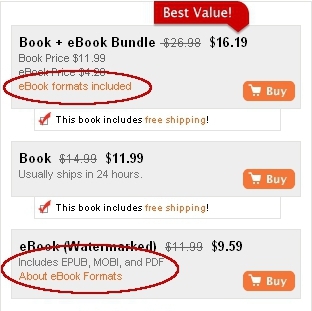 The watermarked EPUB and PDF formats sold in our store can be transferred to your eReader by plugging it in directly to your computer. Click to learn how to transfer and read books on your NOOK Tablet, NOOK Color, and NOOK or to transfer and read books on your Sony Reader. The watermarked EPUB and PDF formats sold in our store can be transferred to your eReader using an eBook management and conversion programs such as Calibre. Click to learn more. At the time of this writing, it was not possible to read books purchased outside of the B&N store on any of the NOOK apps (for iPhone, iPad, Android, PC, or other devices). It is possible that a future update will change this. If this happens we will update these instructions to include the use of those apps. If a book is available as an eBook on our Store, the available formats and prices will be displayed on the product page, as highlighted in the image below. Click the Buy button to purchase the eBook. Once you've completed the purchase, your eBook is available for download on your Account page (accessible at the top of any page on our sites). Once on your Account page, all of the available formats for your purchased eBooks will be displayed as links. Click on the link of the appropriate format (either EPUB or PDF for NOOK and Sony eReaders) to download the eBook to your computer. Be sure to remember where you save the file — you'll need it when transferring the eBook to your device. Once you've downloaded an eBook, you need to transfer it to your eReader device. Specific instructions for the NOOK Tablet / NOOK Color and NOOK follow. Several ways exist for you to load eBooks onto your NOOK HD or NOOK HD+ (called sideloading): by connecting your NOOK HD or NOOK HD+ to your PC or Mac and copying the files over, by copying the files to a MicroSD card and inserting that card into your NOOK HD or NOOK HD+, or by using a program on your PC for eBook management such as Calibre. We will explain how to sideload eBooks with your NOOK HD or NOOK HD+ connected directly to your computer. Basic instructions on using Calibre can be found below. Connect your NOOK HD or NOOK HD+ to your computer using a USB cable. Microsoft Windows users will see the MyNOOK appear as a new drive in My Computer (you'll see an additional drive if you have a MicroSD card inserted in your NOOK Tablet or NOOK Color). Mac users will see a MyNOOK drive on their desktop. WINDOWS USERS: If this is the first time you have connected your NOOK HD or NOOK HD+ to your PC, Windows will automatically update any drivers. This allows the PC to communicate with the NOOK HD or NOOK HD+. When Windows is done updating the drivers, it will prompt you how to treat the device. Choose Open Device to View Files Using Windows Explorer. The NOOK HD or NOOK HD+ will then appear in Windows Explorer as a drive labeled either as NOOK or by the model number: NOOK HD is BNTV400 and NOOK HD+ is BNTV600. 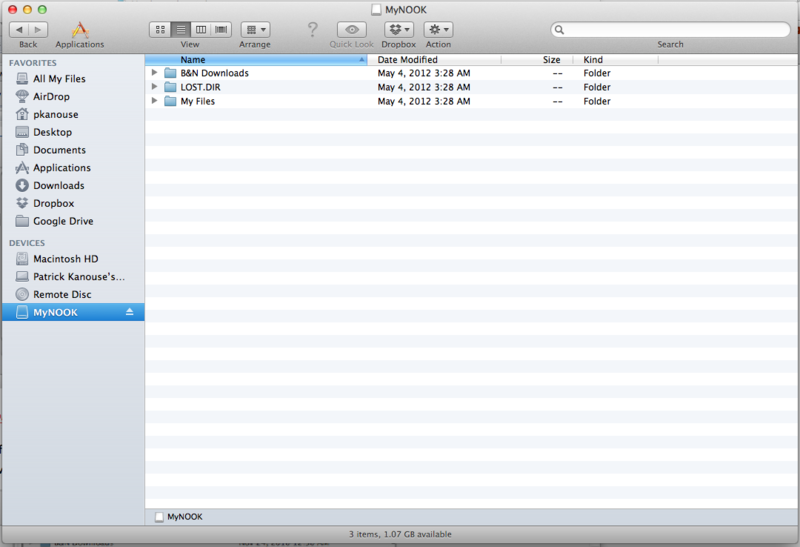 MAC USERS: If this is the first time you have connected your NOOK HD or NOOK HD+ to your Mac, you will see a NOOK drive on your desktop or in Finder. Open NOOK and double-click MyNOOK Setup. You are warned that this is a web application. 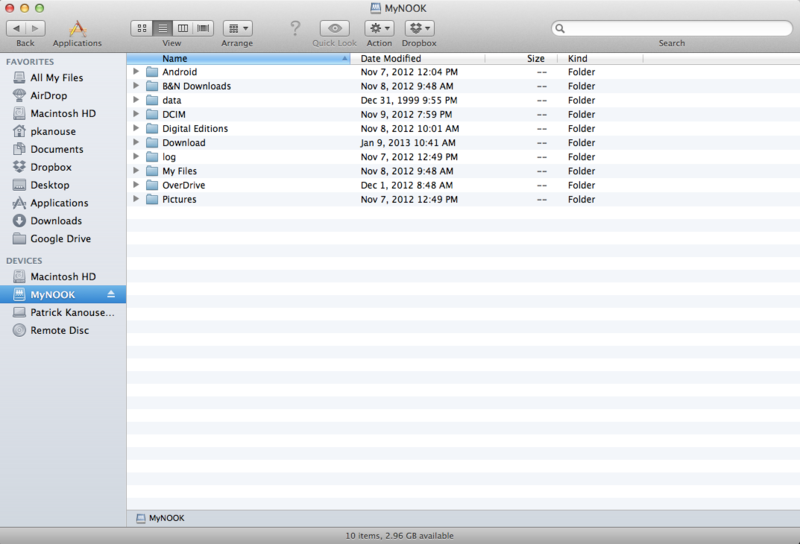 Click Open, which downloads the MyNookSetup.dmg.zip file. Unzip the file and double-click the resulting file: MyNookSetup.dmg. A window appears. Double-click the MyNook Setup.mpkg file, which starts the Install MyNOOK Setup wizard. Click Continue. Review the Software License Agreement and click Continue. Click Agree. Click Install. Once the installation is complete, click Close. 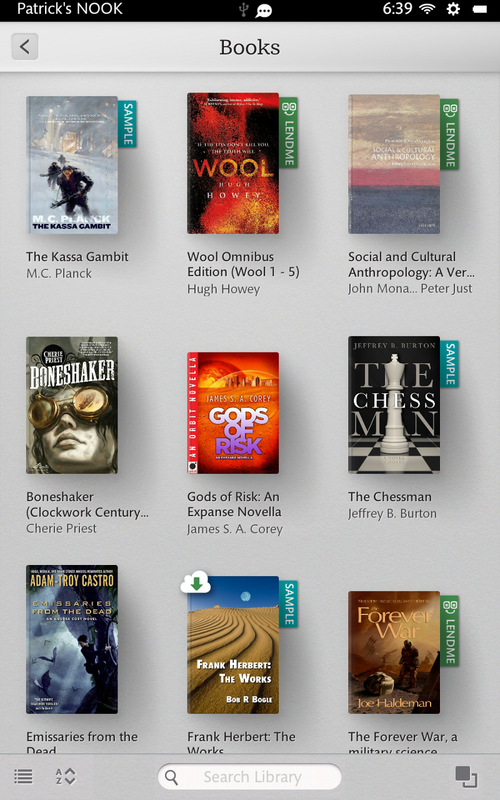 This one-time installation allows you to access the NOOK HD or NOOK HD+ to add files. Copy the EPUB file from its location on your computer to the My Files\Books folder in the MyNOOK window. On your NOOK HD or NOOK HD+, from the Home screen, tap Library and then tap the Options and then tap Refresh to update your NOOK's Books folder. From the Home screen, tap Library and then tap Books. From the Home screen, you can type the title in the Search My NOOK box and then tap Return to do a quick search for the book. 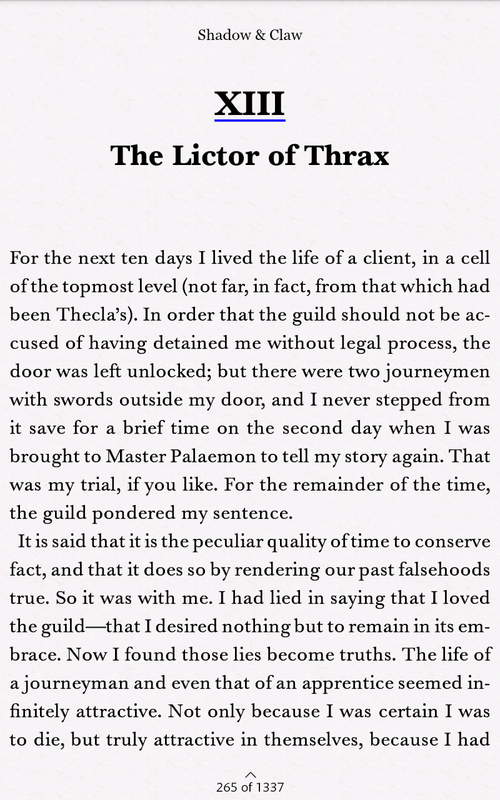 To turn to the next page in the book, swipe the screen from right to left. To return to the previous page, swipe the screen from left to right. To change the size of the onscreen text, tap the reading screen, tap Text and tap the A text that matches the size of the font you would like. There are multiple ways to load eBooks onto your NOOK Tablet or NOOK Color (called sideloading): by connecting your NOOK Tablet or NOOK Color to your PC or Mac and copying the files over, by copying the files to a MicroSD card and inserting that card into your NOOK Tablet or NOOK Color, or by using a program on your PC for eBook management such as Calibre. We will explain how to sideload eBooks with your NOOK Tablet or NOOK Color connected directly to your computer. Basic instructions on using Calibre can be found below. Connect your NOOK Tablet or NOOK Color to your computer using a USB cable. Microsoft Windows users will see the MyNOOK appear as a new drive in My Computer (you'll see an additional drive if you have a MicroSD card inserted in your NOOK Tablet or NOOK Color). 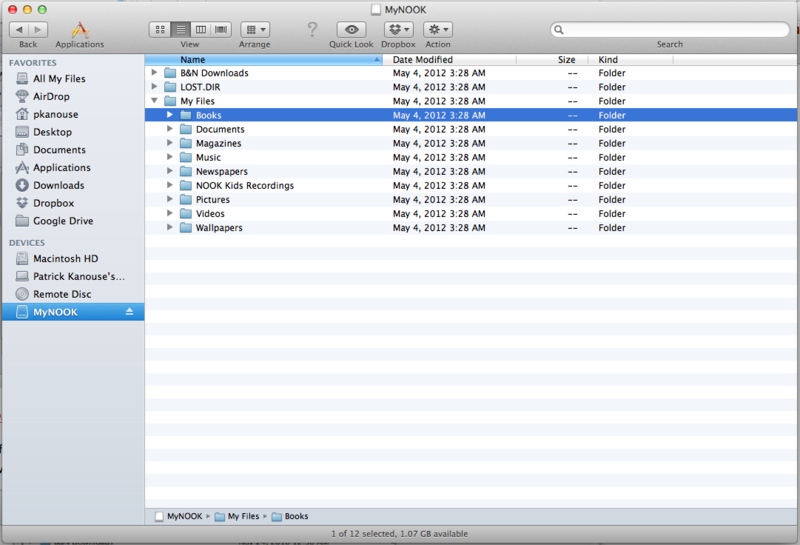 Mac users will see a MyNOOK drive on their desktop. On your NOOK Tablet or NOOK Color, from the Quick Nav Bar, tap Library and then tap the sync button to refresh your NOOK's My Documents folder. Connect your NOOK to your computer using a USB cable. Microsoft Windows users will see the NOOK appear as a new drive in My Computer (you'll see an additional drive if you have a MicroSD card inserted in your NOOK). Mac users will see a NOOK drive on their desktop. Copy the EPUB file from its location on your computer to the My Files\Books folder in the NOOK window. On your NOOK, tap from the Quiv Nav bar, tap Library and tap the sync button to refresh your NOOK's My Documents folder. To turn to the next page in the book, swipe from right to left on the touchscreen. To return to the previous page, swipe from left to right on the touchscreen. To change the size of the onscreen text, tap the touchscreen and then tap Text. Tap the letter A in the menu that appears to adjust the text size. 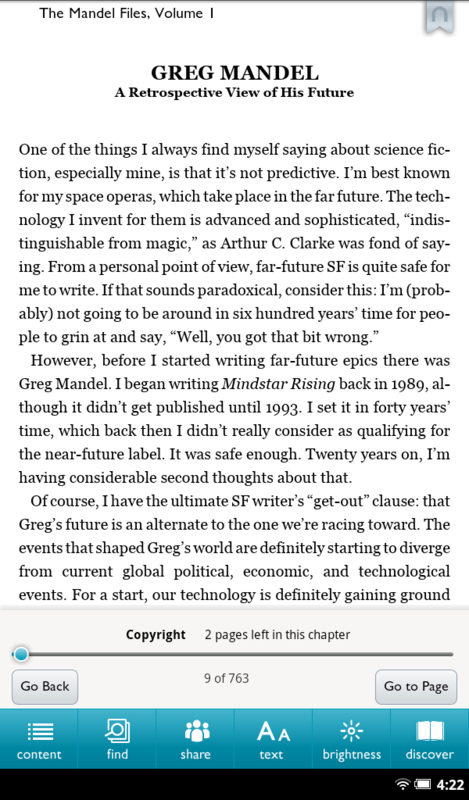 Tap the x button or the page of the ebook where text appears to return to reading. Another easy way to manage the eBooks on your NOOK is to use a free eBook management software for your PC such as Calibre. These programs will allow you to transfer eBooks to and from your NOOK as well as read non DRM-protected files on your computer. Basic instructions on using Calibre can be found below. Open the Reader Library software and connect your Reader to your PC or Mac with a USB cable. Sign in to your Reader Store account. Within the Reader Library, locate the purchased EPUB file on your hard drive. 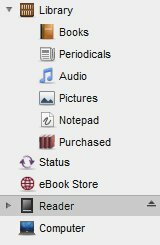 Drag your eBook from your Library to the "Reader" icon located in the left nav area of the Reader Library software. Click on the Reader icon to verify that your new book has successfully transferred to your device. Once confirmed, you can now disconnect the USB cable and read your book on your eReader. Calibre is a program that helps manage the library of eBooks on your computer. You can download it fromhttp://calibre-ebook.com/download. You can find more complete instructions on its use at http://calibre-ebook.com/user_manual/. Transferring eBooks to different devices in Calibre is fairly simple. There are more detailed settings that allow customization and personalization, but we'll stick to the basics here. 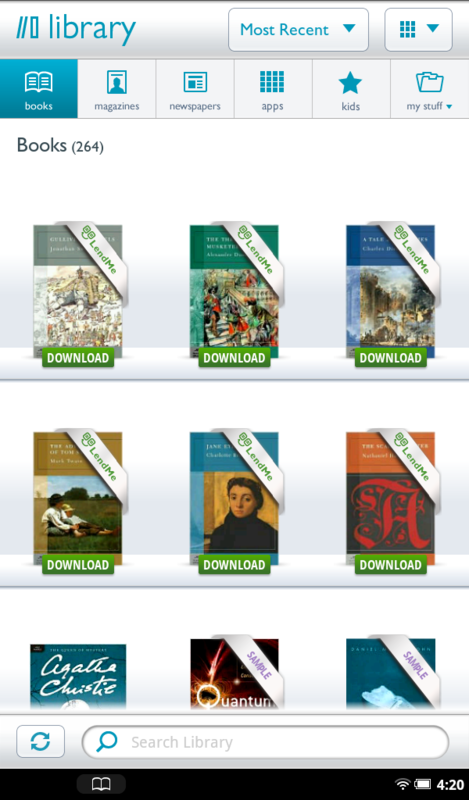 Click the "Add books" and browse the directory to which you downloaded your eBook files (EPUB and/or PDF). The files will appear in list view in the main window (Library). Connect your eReader device (NOOK, NOOK Tablet, NOOK Color, or Sony Reader) to your PC via USB cable. To transfer the new files to your eReader, highlight the files you wish to have on your eReader and click the "Send to device" button at the top of the window and select your device. 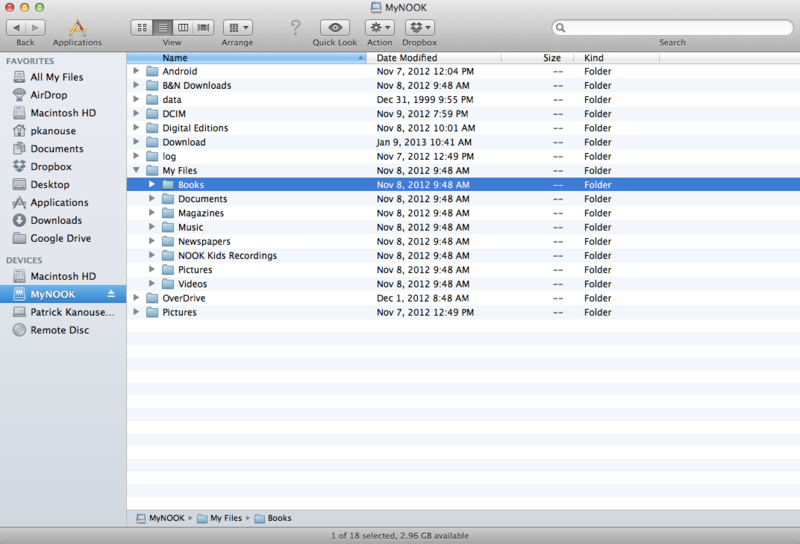 Or, alternately, drag your file from your Library onto the "Device" button at the top. Do not run the Sony Reader Library software at the same time as Calibre. If you wish to use both programs, be sure to only use one at a time. It is recommended that you disconnect your eReader from your computer when you are finished using one program before starting the other.